A 60 MINUTE LIVE MUSIC, FILM AND 3D PROJECTION/MAPPING EVENT. 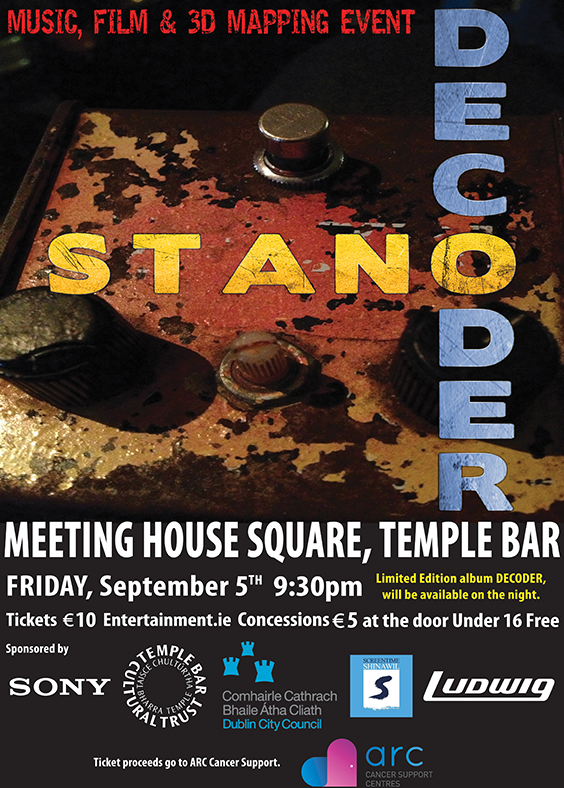 Following the success of last years ‘UNSPOKEN’ event in Meeting House Square, Temple Bar, Stano brings ‘DECODER’ to the same venue, on Friday, September 5th. Under the award winning, giant umbrellas in MHS, which create an amazing indoor / outdoor space in the City Centre, Stano presents DECODER, a one hour, Music, Film and 3D Projection experience. Featuring, on Guitar, Sean Coleman, Jen Rabs and Niall O’Shea and on Drums, Simon Freedman, Johnny Boyle and Daz Oglesby. DECODER is presented in association with Sony , TBCT, DCC and Screentime Shinawil.